A Shropshire man who has 'plumbed the depths' of the globe has come back to his roots to join the expanding family firm in the north of the county. Will Reeves, aged 31, was a former pupil of Bedstone Collage and left for a life on the high seas as a merchant navy marine engineer, followed by a decade as a commercial diver working in oceans across the world from Nigeria and Japan to the coast of Scotland, firstly as a diver himself and then latterly as a supervisor. 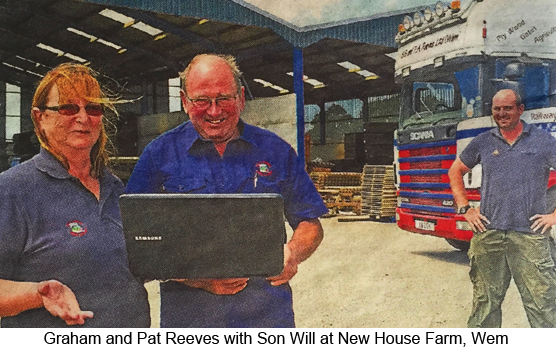 Parents, Graham and Pat Reeves were former dairy farmers and cattle dealers who diversified, and are this year celebrating 35 successful years in the timber business at New House Farm, The Lowe, Wem, which is now the largest independent timber merchants in the county. Pat said "From a modest start selling a few railway sleepers in 1980, our timber business has grown steadily over the years and we now supply major outlets such as Travis Perkins and Jewson with a wide range of timber products including telegraph poles, sleepers, posts, barriers, wood bark and our own fencing panels made on site. "Being traditional farming folk we like to create a trusted and personal approach and believe that this is what has served our business so well with both commercial and domestic customers alike, and we are delighted to welcome Will on board as a breath of fresh air for the firm. "Graham and I do not use computers and all of our invoices and accounts are handwritten, with boxes of files going back over the years. So Will is now trying to drag us into the 21st century by introducing new technology and we even have something called a Facebook page, which he says is already bringing sales results." Will, added: "Even after travelling the world there is nowhere that I love more than the green and rolling countryside of north Shropshire and I am really happy to be back with my wife and young son, joining the family business and looking forwards helping my parents move the company forward in the future."